Click here to check out our live video jukebox. 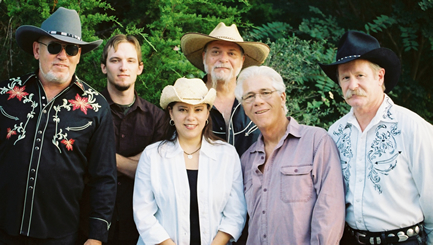 The Drugstore Cowboys are currently based in San Antonio, Texas. Americana, Texacana, Classic Rock, 90's Rock, R & B, Classic Country, Top 40 Country, Blues-Based Rock & Roll. Snapshots taken by and of friends, fans, and the band! The Drugstore Cowboys have just completed recording their third CD. The new CD is as wide and far ranging as Texas itself and includes songs penned by Mallet, Robinson and David Kemp. It features Jan, Dub, Dave and Steve on vocals and represents the band as it actually is in person. The chosen songs display the versatility of The Drugstore Cowboys' style and always get a great response when performed live. Admired by fiercely loyal fans, The Drugstore Cowboys have brought their electric energy to venues throughout the US and Europe. With four distinct and talented singers up front, a rock-solid rhythm section and blistering instrumentalists, The Drugstore Cowboys' musical dynamics are hard to deny. The band's artistry on lead and rhythm guitar, bass, keyboards, drums, and strong vocals have earned them a place on stage with music legends Willie Nelson, Merle Haggard, Hank Williams Jr., Gregg Allman, Ronnie Milsap, David Alan Coe, Charlie Daniels, Alabama, Johnny Paycheck, Con Hunley, Flaco Jimenez, the Warren Brothers, Micahel Murphy, Elvin Bishop, McBride and the Ride, Terry Biggs, Steve Wariner, the Mavericks, Gary P. Nunn, Freddy Fender, Charly McClain, Buddy Emmons, Buck Trent, Joe Ely, Jerry Jeff Walker, Eddie Raven, Gatemouth Brown, Asleep at the Wheel, Mel Tillis, John Anderson, the Sweethearts of the Rodeo, David Frizzell, Leroy Parnell, Restless Heart and Daryl Singletary. They've been backup band for Frenchie Burke, Johnny Rodriguez, Johnny Bush, Gary Stewart, Gene Watson, Roy Head, and the list goes on and on. The Drugstore Cowboys' first recordings date back to 1973 with a succession of original works right up to the present. The Drugstore Cowboys have re-released their second CD Shades featuring the magnificent vocals of Jan Zerda, performing nine songs penned by Robinson specifically for her.